Let’s say you at the RV facility where you park up for the night (or in the national park) you don’t have easy access to a sewage connection. Your sewage tank on your RV is full and desperately needs to be emptied. What’s the solution? A portable RV waste tank. Connect your waste tank to the main sewage tank on your RV, and turn on the drain pump. When the portable tank is full, wheel it over to any sewer hookup or dump site and drain the portable tank. Which one is right for your RV? Here are our product reviews and buyer’s guide to make sure you get the best RV portable waste tank for your needs. Comes with all hoses and fits standard 3-inch RV hoses and garden hoses. Stores neatly and conveniently when not in use. For RV owners who like to “rough it” frequently or find they don’t have easy access to a sewer hookup, this is one of the best portable tanks you can get. It’s easy to move, easy to fill, and even easier to empty without the need to lift the tank itself. The front-swivel handle and wheels make this a dream to maneuver into place, and the 3-inch drain valve makes it easy to completely empty the tank without lifting it. Best of all, the pneumatic tires handle dirt trail, gravel, and asphalt equally well. While it rolls easily, this tank weighs 47 pounds even when it’s empty. It’s not exactly a featherweight if you need to unload it from your truck or RV and then put it back when you’re done with it every time. This can also be something of a pain to clean even with the 3-inch inputs and outputs. This portable waste tank is great for Class C RVs, and it stores easily thanks to the integrated ladder hook. All connections are standard, and there is also a garden hose connection for easier flushing and cleaning. The ladder hook makes a big difference when it comes to finding a way to store this tote tank securely and conveniently. The low placement of the drain valve is a huge help when you go to empty it out, too. The twenty-one gallon capacity may be a bit small if you have a larger Class C or A RV, but it’s perfect for medium to small size Class C’s and campervans or 5th wheels that have waste tanks.Additionally, while the wheels are large, no-flat tires can make for a bumpy ride on uneven terrain. An excellent mid tier product, this high capacity tank is great for C class and 5th wheel RV owners. It’s easy to use and can even be pulled behind a truck or ATV to get it to the dump site. Hard rubber wheels don’t go flat, and they last much longer than plastic or nylon wheels. The towing arm is perfect for use with golf carts, ATVs and pickup trucks. Best of all, this model has an onboard storage compartment for easy access to all hoses, clamps, and other accessories. Too many lastic parts besides the tank. Not much metal reinforcement makes me worry about the integrity of the tank long term or while being towed. Also, you have to lift this model to get it to drain completely. One of the smaller 4-wheel models, this towable RV waste tank is both versatile and easy to transport from your RV to a dump site. Like most 4-wheel models, it also doesn’t need to be lifted in order to drain it all the way, making emptying your waste tank much easier and cleaner. It’s fairly small for Class C RVs, has a plastic tow handle with little metal reinforcement. The wheels may have rubber tires, but the wheel rims themselves are plastic. Not a great combination if you hit a tree root or a rock while towing your waste tank to the dumps site. When you need a budget option so you can drain your 5th-wheel or Class C RV, the Tote-N-Store is great option. It’s got a four wheel design with front casters to make it easier to maneuver, and the pulling handle can be looped over most tow-hitches. Four wheel waste tanks will always be a better option than two-wheel models, especially when it comes to going easy on your arms, shoulders and back. This model also has a handy built-in storage box for all your accessories, so you don’t have to go hunting them down every time you need to drain the tank. There is no padding or contouring on the tow handle grip at all, and it can be painful to pull if you aren’t towing it. There’s also many plastic in the design, which raises durability concerns. Finally, plastic and rubber wheels tend to break far more easily than metal and rubber or pneumatic tires. Here are some key considerations to mull over before purchasing a portable waste tank for your RV..
Class A RVs generally don’t travel well where you would need a portable waste tank, and most owners don’t tend to park them anywhere but an RV park with a full set of hookups. 5th wheel trailer owners and Class C RV owners should definitely consider keeping a portable waste tank for their RV since they can travel to off-grid locations where there are no RV hookups. What is your RVs sewer tank capacity? You don’t need your portable tank to match your RV tank size, but you want to be able to drain away what’s in there in as few trips as possible. What kind of terrain will you be traversing? If you’re dragging this tank by hand over rough trail, gravel or broken asphalt, you may find some models work better than others. If you are going to tow it behind a golf cart or ATV, you will find the task and options much easier. On an average trip, how many people will be traveling with you? How often the waste tank needs to be emptied depends on how many people are using your RV’s toilet. More people means you need to drain that tank more often. The bigger the portable tank you buy, the fewer trips you’ll have to make, and if you don’t need to empty it as frequently you may be fine with a smaller tank. 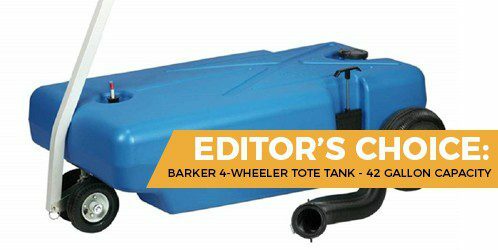 On the whole, my first choice would be the Barker 4-Wheeler Tote Tank - 42 Gallon Capacity. Pretty much any waste tank can be emptied in one trip, you can tow it behind a golf cart or ATV, and it’s built tough from high-impact plastic, steel and aluminum. I feel confident that this tank is going to last for years and make draining waste from my RV a tidy process that involves no strong odors or cleanup. Check this model out if you need a new portable RV tank, and I’m certain you’ll find it trustworthy and convenient, too.